Before Claire Fuller was a writer, she was an artist, a sculptor. No surprise that her first novel is full of exquisite detail, captured by an eye trained to observe, then reflect back to others what she perceives. Early ringing endorsements from The Sunday Times (‘Extraordinary – from the opening sentence it is gripping’), The Times (‘Fuller handles the tension masterfully in this grown-up thriller of a fairy-tale’), as well as being selected by Amazon as one of their most exciting debuts of the month, have marked her as an author to watch. Most might consider the prospect of spending time in a cabin in the woods as an idyll; a place to daydream in peace and quiet. 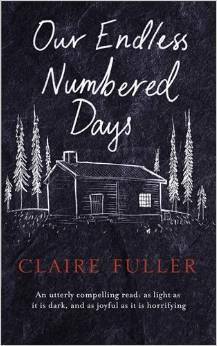 However, Claire Fuller’s ‘die Hutte’ in Our Endless Numbered Days is anything but tranquil. Peggy Hillcoat’s adolescence is unusual, terrifying. Luckily for Fuller, her protagonist’s experience is not in any way biographical, though fragments of her own life, alongside that of her children’s, her husband’s, plus various friends, have been patch-worked together to form believable characters and situations. A writing assignment from the MA course on Critical and Creative Writing (University of Winchester) provided the inspiration for what would eventually turn into her first book. As well as the professional guidance received through attending the course, Claire draws invaluable encouragement from a writing group she attends, as well as huge support from the wider writing community represented within Twitter. The success of her first book has been rapid. It took twelve months to turn the original idea from two scenes of screenplay into a full length novel; a further three months to polish, and then, in a fit of impatience, she sent a 140-character pitch to #pitmad, who liked what they saw. On the back of such encouragement, Claire used Agent Hunter (www.agenthunter.co.uk) to approach twelve agents; three replied, including two requests for submissions. Following her instincts, rather than conventional wisdom, Claire almost immediately decided on Jane Finigan from Lutyens and Rubenstein: they got on well, and Claire liked her suggestions. Also, the allure of a smaller agency looking for debut novelists appealed to her. The initial editing process took Claire and Jane approximately six weeks, by which time Jane was happy to pitch to some publishers. Twelve seems to be significant number for Claire, as that is how many publishers Jane contacted. Within days, three offers had been made and Claire found herself in the enviable position of having her novel at the centre of a bidding war. Again, trusting to instinct, Claire chose Fig Tree and their editor Juliet Annan, who she felt most comfortable with; it was a bonus that they were also the ones who made the highest offer. Our Endless Numbered Days was written against a back-drop of full-time employment and self-set deadlines. The follow-up novel is afforded more space, though now that Claire is released from such time constraints, she says it almost seems harder to write. For many years she has kept the discipline of producing a 100 word flash fiction piece every Friday, and this sharp, measured style is honed in her work. Her determination is a hallmark in this pursuit of excellence, and it is with great anticipation we await her next novel. This entry was posted in Winchester Reading Series 2015 and tagged author, Author Talk, Claire Fuller, MA Creative & Critical Writing, Our Endless Numbered Days, Reading Series, Winchester Reading Series by Litmus 2015. Bookmark the permalink.